What is FERC required to do? What is FERC required to do to justifiy a pipeline certificate and eminent domain? John Peconom of FERC told me that federal eminent domain was justified by Florida needing the gas, therefore it was for the good of the United States. Peconom didn’t provide a reference, but FERC’s own documents say FERC is supposed to balance public benefits, which means somebody has to demonstrate those public benefits. Also, one-time payments to landowners may not be enough. Briefly describe the purpose of and need for the facilities. Include in the description the total volume of gas to be delivered by the facilities, the location of the gas receipt and delivery points, a listing of each customer, and the volume of gas delivery to each customer. That’s the very first thing required for a FERC environmental report. Which makes it seem curious that EPA had to ask for this information. This manual is a guide to sponsors of natural gas projects who file environmental information with the Federal Energy Regulatory Commission (FERC or Commission). The manual provides helpful information about required environmental documentation and is intended to be a “cookbook” for preparing that documentation, but is not a substitute for the regulations themselves. 2 The Commission’s regulations, which are in Chapter 18 of the CFR, will be cited by section or part, for instance § 2.55 or Part 380, rather than as 18 CFR 2.55, or Part 380 of Chapter 18 or 18 CFR 380. References to other agencies’ regulations will include the full citation, for instance 40 CFR 1506. So there’s where to look for any actual requirements. To meet NEPA requirements federal agencies prepare a detailed statement known as an Environmental Impact Statement (EIS). EPA reviews and comments on EISs prepared by other federal agencies, maintains a national filing system for all EISs, and assures that its own actions comply with NEPA. The Environmental Protection Agency (EPA), like other federal agencies, prepares and reviews NEPA documents. However, EPA has a unique responsibility in the NEPA review process. Under Section 309 of the Clean Air Act, EPA is required to review and publicly comment on the environmental impacts of major federal actions, including actions which are the subject of EISs. If EPA determines that the action is environmentally unsatisfactory, it is required by Section 309 to refer the matter to CEQ. What is this CEQ we already saw FERC mention? The National Environmental Policy Act (NEPA) [42 U.S.C. 4321 et seq.] was signed into law on January 1, 1970. The Act establishes national environmental policy and goals for the protection, maintenance, and enhancement of the environment and provides a process for implementing these goals within the federal agencies. The Act also establishes the Council on Environmental Quality (CEQ). The complete text of the law is available for review at NEPAnet. This all gets a bit far afield of the basic question: is U.S. need for the gas necessary for FERC authorization of a pipeline. 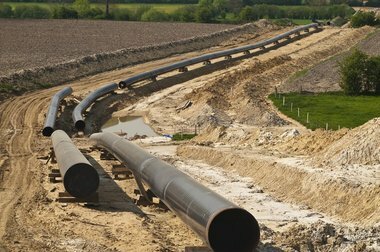 Under section 7 of the Natural Gas Act, the Commission reviews applications for the construction and operation of natural gas pipelines. In its application review, the Commission ensures that the applicant has certified that it will comply with Department of Transportation safety standards. The Commission has no jurisdiction over pipeline safety or security, but actively works with other agencies with safety and security responsibilities. To meet the growing demand for natural gas, the Commission must continue to respond quickly when companies propose to expand and construct needed pipelines and related facilities. The Commission has expedited the certification of natural gas pipelines by having Commission staff actively participate in projects that were using the pre-filing process to engage stakeholders in the identification and resolution of stakeholder concerns prior to the filing of a certificate application with the Commission. The staff’s participation and initiative in these efforts will allow for the filing of better certificate applications enabling more efficient and expeditious licensing actions by the Commission. That sounds like FERC is a marketing agency for pipeline companies. Which would fit with FERC being funded by the very industries it regulates. 10. The Certificate Policy Statement provides guidance for evaluating proposals to certificate new construction.1 The Certificate Policy Statement established criteria for determining whether there is a need for a proposed project and whether the proposed project will serve the public interest. The Certificate Policy Statement explained that in deciding whether to authorize the construction of major new natural gas facilities, the Commission balances the public benefits against the potential adverse consequences. The Commission’s goal is to give appropriate consideration to the enhancement of competitive transportation alternatives, the possibility of overbuilding, subsidization by existing customers, the applicant’s responsibility for unsubscribed capacity, the avoidance of unnecessary disruptions of the environment, and the unneeded exercise of eminent domain in evaluating new pipeline construction. 11. Under this policy, the threshold requirement for pipelines proposing new projects is that the pipeline must be prepared to financially support the project without relying on subsidization from existing customers. The next step is to determine whether the applicant has made efforts to eliminate or minimize any adverse effects the project might have on the applicant’s existing customers, existing pipelines in the market and their captive customers, or landowners and communities affected by the construction. If residual adverse effects on these interest groups are identified after efforts have been made to minimize them, the Commission will evaluate the project by balancing the evidence of public benefits to be achieved against the residual adverse effects. This is essentially an economic test. Only when the benefits outweigh the adverse effects on economic interests will the Commission proceed to complete the environmental analysis where other interests are considered. 6 Certification of New Interstate Natural Gas Pipeline Facilities, 88 FERC ¶ 61,227 (1999), clarified, 90 FERC ¶ 61,128, further clarified, 92 FERC ¶ 61,094 (2000) (Certificate Policy Statement). Under section 7(h) of the NGA, a pipeline with a Commission-issued certificate has the right to exercise eminent domain to acquire the land necessary to construct and operate its proposed new pipeline when it cannot reach a voluntary agreement with the landowner.9 In recent years, this has resulted in landowners becoming increasingly active before the Commission. Landowners and communities often object both to the taking of land and to the reduction of their land’s value due to a pipeline’s right-of-way running through the property. As part of its environmental review of pipeline projects, the Commission’s environmental staff works to take these landowners’ concerns into account, and to mitigate adverse impacts where possible and feasible. After satisfaction of the threshold no-subsidy requirement, the Commission will determine whether a project is in the public convenience and necessity by balancing the public benefits against the adverse effects of the project. The public benefits could include, among other things, meeting unserved demand, eliminating bottlenecks, access to new supplies, lower costs to consumers, providing new interconnects that improve the interstate grid, providing competitive alternatives, increasing electric reliability, or advancing clean air objectives. Among the adverse effects the Commission will consider are the effects on existing customers of the applicant, the interests of existing pipelines and their captive customers, and the interests of landowners and the surrounding community, including environmental impacts. The Commission will approve a project where the public benefits of the project outweigh the project’s adverse impacts. Several requests for rehearing raise issues relating to some of the factors to be considered in the balancing process: the consideration of effects on existing pipelines and their captive customers, the timing of the consideration of environmental impacts, and the ability of an applicant to acquire the necessary rights-of-way without the need to use eminent domain to obtain rights from landowners. To balance public benefits, somebody has to demonstrate they exist. And I don’t see LNG export as an example public benefit. The Policy Statement notes that, as part of its environmental review of projects, the Commission will work to take landowners’ concerns into account, and to mitigate adverse impacts where possible and feasible. AFPA states that whether, and to what extent, new facilities may affect the property of landowners on the proposed route are significant factors for the Commission to consider in weighing public benefits against adverse impacts. Noting, however, that if eminent domain proceedings are necessary to obtain rights-of-way, the landowners will receive proper compensation for such rights-of-way, AFPA concludes that the compensation that a landowner would receive in such a proceeding should be considered by the Commission in its analysis of the economic impacts on the landowners that would result from the construction of new pipeline facilities. The Policy Statement encouraged project sponsors to acquire as much of the rightof-way as possible by negotiation with the landowners and explained how successfully doing so influences the Commission’s assessment of public benefits and adverse consequences. The Policy Statement nonetheless recognized that, under section 7(h) of the NGA, a pipeline with a Commission-issued certificate has the right to exercise eminent domain to acquire the land necessary to construct and operate its proposed new pipeline when it cannot reach a voluntary agreement with the landowner. Even though the compensation received in such a proceeding is deemed legally adequate, the dollar amount received as a result of eminent domain may not provide a satisfactory result to the landowner and this is a valid factor to consider in balancing the adverse effects of a project against the public benefits. Finally, FERC 61,094 (2000) seems to have no additional material about eminent domain. Not that that’s the end of the matter. As mentioned, EPA and DoJ’s LAS also get into the act, not to mention Congress, and despite various assertions that local and state ordinances and laws don’t apply, I’ve seen at least one ruling by FERC’s own Commission saying that while in theory FERC could overrule all of those, in practice it tries not to. I am not a lawyer, and I don’t play one on TV. Maybe some of the above will prove useful as input for the actual lawyers considering these points, although I would hope the lawyers all already know this stuff. Then there’s the even more basic point: if it gets too expensive for the pipeline company to deal with all the objections, it may decide the project is just not profitable. Like Williams Company just did about the Bluegrass Pipeline. EPA is just going to be reviewing an EIS written by private contractors employed by Sabal Trail. That could delay but probably not stop this pipeline.